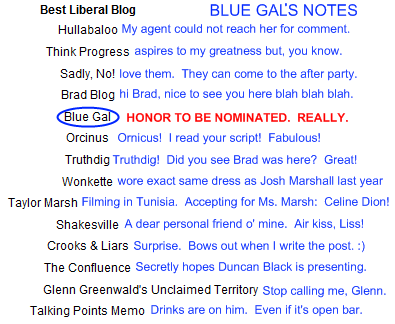 Blue Gal: Best Liberal Blog Nominee. I sort of expected some technorati-based acknowledgement of my small traffic to frequent writing ratio, but this...so this...kinda blows me out of the water. 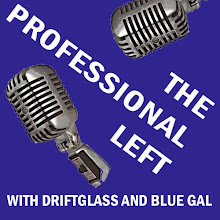 (Go Driftglass for best individual blogger and Jon Swift for best humor blog. Just sayin'). Wow, nice swag there, BG! Like, CONGRATS! So cool and so very well deserved!! That is so great. Can hardly wait to vote for you! Congratulations, Blue Gal, you're the best; it will be a pleasure to vote early and often! Where do you get a Publicist? Way to go, BG, and so well deserve. too grand!!! way ta go! No surprise here. Well deserved recognition. Congrats. I received the news as I was conversing with the bold and durable Cal Ripken Jr. we both agreed congratulations are in order, so please take this to be them. and also too, cha cha CHA! By "liberal" do they mean politically leftish, or is this a reference to the amount of mayo you put in your tuna salad? Congratulations, Blue Gal! I will be spreading the word. Let me add my congratulations. Nice to know that hard work, perseverance and talent is noticed. sweet! very much deserved! fingers are crossed for you, not that you need that kind of luck! congrats to you! I cannot believe I did not post a comment: Congrats, BG! 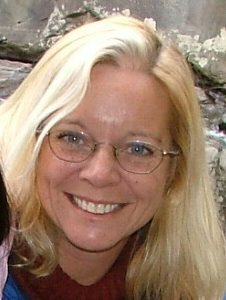 Those other bloggers should be honored to be mentioned in the same breath as you! Congrats to you!!! You Go! A test for Hillary Clinton. Another reason why Blago has to go and fast. Stone cold sober, as a matter of fact. Gentlemen, we have to talk. There is video of this Hello Kitty Wedding. What Bob Herbert said. And didn't say. Oh my God! You killed Kitty!